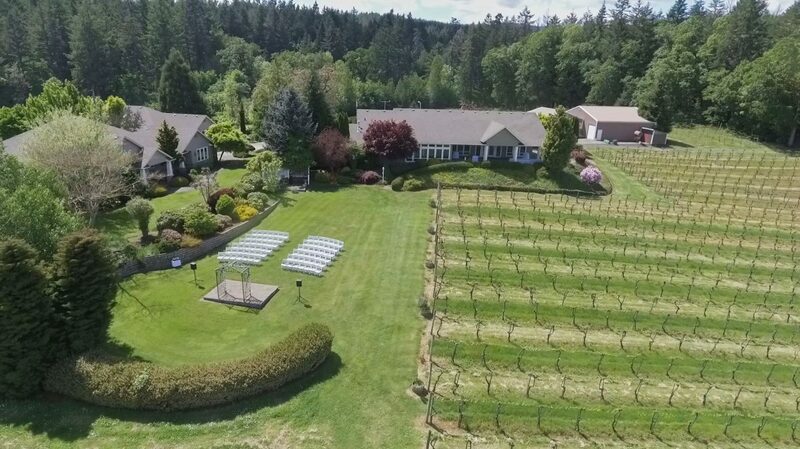 BeckenRidge Vineyard offers a beautiful site for your wedding, and reception in a private setting. Enjoy the majestic views and the old world charm of our facility. The facilities at BeckenRidge Vineyard nicely accommodate groups from 20 to 250. Reservation of the facility assures your exclusive use of building, patio, and lawn. There will be no public access during your event. Private space available for use by any professional caterer of your choosing. Bar service is available for wine, beer and champagne, with purchases made two months before event. Beverages served in glassware; no minimum required. Included in rental, is use of; grand piano, or built-in sound equipment which includes microphone, CD player, and auxiliary (i.e. ; iDevice, MP3 player) hookup. Or outside musicians or DJ are welcome. Ivory and white table cloths available for rent. Handcrafted metal arch available for your decorations. BeckenRidge Staff sets up the tables and chairs for ceremony and reception which are included in the facility rental and accommodate up to 150 guests. Additional tables and chairs may be brought in, with set-up and tear-down done by the renter.